So for the last couple of Sundays I have been getting some warm up here before going to The Pit. On the corner of Lorimer and Harrison in Brooklyn this school yard set of courts is clean, quiet, and a short ride from the Williamsburg Bridge. Because of New York Bike Polo’s agreement to limit it’s use of The Pit and the sun going down so damn early we need a place to play from noon till 2pm. See it on the NYC Polo & Spots map. Show up for practice and pick-up Sundays Noon till 2pm. 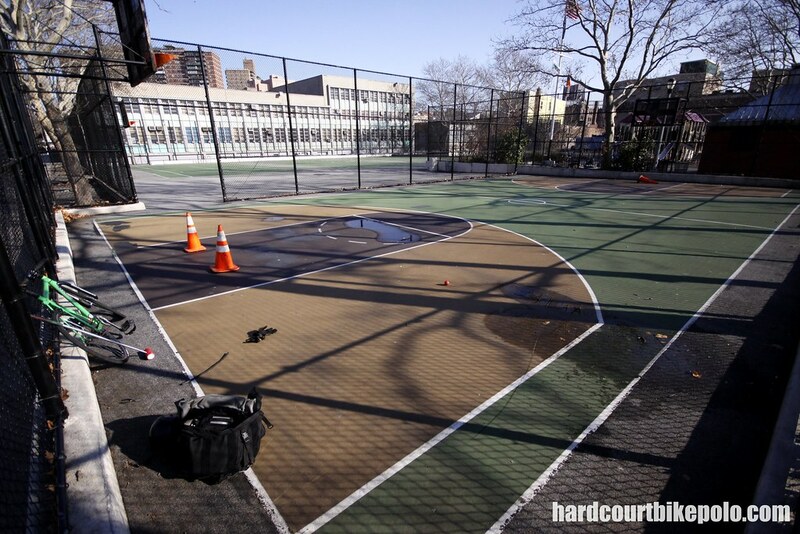 This entry was posted by Doug D on December 11, 2009 at 3:01 pm, and is filled under Bike Polo, Just One, New York. Follow any responses to this post through RSS 2.0. You can leave a response or trackback from your own site. Can you tell us more about this agreement to limit use of the pit. That court looks pretty amazing i like the curb.